America chooses to lie with the devil. Lured by riches and comforts, she begs at the expense of others. Promised wealth and power, she holds fast to political deceit. She’s grown accustomed to the gifts of Satan, even prefers them above what God provides. America was once a nation of Israel, meaning “Champion for God”. Her roots can be traced to the lost Tribe of Joseph through his son Manasseh. Now, she cries out against God, insisting on laws to protect her lover, the great divider, who has conquered her. She is a nation, a collection of individuals, who must collectively endure the blessings and punishments of God. The nation of Israel entered into marriage with God at Mount Sinai and she (Israel) promised to keep His covenants (vows). The ultimate goal was to lead all peoples to God’s salvation, by example. But over time, she began to disbelieve and then grew defiant. Instead of keeping the vows, she made up her own, even making abominations acceptable. She idolizes others, awing at singers, actors and athletes. She obeys others, keeping the silly laws of politicians over what was good and just. She covets what her neighbors have, buying materials that production and disposal destroy. She calls others father although there is only one Father. She calls others masters although there is only one Master. She steals, taking more than her share of resources. She murders, allowing the deaths of millions in drummed-up wars. And these are just to name a few of her adulteress acts. She fears her lover, the evil beast-system, more than she fears God. She doesn’t want to lose her worldly treasures at the expense of the salvation of so many souls. And Satan laughs because he hates her for loving God in the first place. He has worked very diligently to deceive her so that she is found guilty in the end. And she will have no recourse, because she kept not her marriage vows by her free-will choice. She listened to Satan’s lies and it’s poisoned a nation. She once witnessed for God. She is now clothed in red, Satan’s color. The “stars of heaven” (star-spangled banner) will fall for punishment and choosing to live by and inflict their own selfish, greedy and evil political systems on the rest of the world, instead of converting the whole world to living by God’s System. Yes, America is one of the two witnesses killed as represented in the Book of Revelations. And those people who were harmed by her will rejoice at her fall because she did whatever she willed to them, whenever she liked. Everyone needs to think real hard, professors and babes alike, about what they are fighting for. If you are not fighting for God and His Will, you are His enemy because you lie with the devil either passively or actively. America, the Great Nation, is part of Israel- the Tribe of Israel, not the counterfeit-Jewish State of Israel. When the Bible refers to Israelites, it refers to the Tribe of Israel, made up of people who live around the world, not in the 1948-designated land renamed Israel. God renamed Jacob “Israel”, and through his 12 sons, the Nation of Israel was born. This is the “Israel” we need to focus on, not the man-made geographic one. When the Bible warns of doom for Israel, it warns of doom for the countries that contain descendants of the Tribe of Israel. God will allow them to be punished by their enemies for not keeping the Covenants with Him. Biblical history demonstrates He allows this punishment. Prophecies foreshadow that He will allow it again, but for the last and final time. In fact, America is already being punished through theft, oppression and enslavement. War and death are next. Go ahead, read the Bible to find out what happens to Israel. Yes, it says Israel will be surrounded. America, as well as Britain and others, are surrounded (well, more like infiltrated) and the walls are closing in from all directions. Why is America the 13th Tribe of Israel? Jacob-Israel’s son Joseph had two sons: Manasseh and Ephraim, with Manasseh representing America, who became great, and Ephraim representing Great Britain, who became a multitude of nations. Let us look at the heraldic symbolism. The Eagle on the American Coat of Arms is the emblem of the Tribe of Dan (who intermingled with their Anglo-Saxon brothers because they landed in America long before the Spanish). The Eagle holds an olive branch and arrows. The olive is the emblem of Jacob-Israel as well as Britannia. The arrows represent a bow, because Joseph was to have a bow. The olive branch held by the Eagle has 13 olives and 13 leaves. 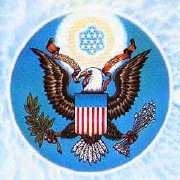 Thirteen reoccurs more: the shield on the Eagle has 13 stripes; there are 13 stars on the presidential seal and 13 spheres of clouds; and there are 13 founding states. It is not in America’s best interest to continue to impose its corrupt system on the rest of the world, i.e. destroying the Middle East. She has come a long way from being a lit candlestick in the world by witnessing for God. She is a witness for evil and corruptness. She has turned Red. The only way for the nation to survive is to turn back to God. As Israel, that is the only way. If America isn’t fighting for God, she is fighting against Him. All the people of the nation will suffer as a nation. The judgment will hit them as a whole. Claim your Israelite rights and be a Champion for God, which is what the word means. Fight the good fight. “The choice before Israel today is between slavery and death on the one hand, and freedom and life on the other; between Satan and Christ. And this choice is the same as that which was offered by God, through the mouth of Moses, to our forefathers at Mount Sinai, ‘See, I have set before thee this day Life and Good, and death and evil. . . . I call heaven and earth to record this day against you, that I have set before you Life and Death, blessing and cursing: therefore choose Life, that both thou and thy seed may live’ (Deut. 30:15-19). This is the very same but a more final warning that was given by God through the last Old Covenant prophet Malachi on the very last page of the Old Testament, foretelling that, just before the Day of the Lord, He would send Elijah the prophet to warn the world to return to His Laws given to all Israelites at Horeb and that He will burn to ashes everyone who refuses to do so.”-source below. Christ Jesus is the King of Israel. He is the same yesterday, today and forever. He is waiting for the children of Israel to plead with Him to come to take His Kingdom, and save civilization. Civilization is in hell; forget the hand-basket. The Children of Israel have been put into a position by Satan to fight with everything they have. And if they fight God’s Way, God will fight for them. It must be His Will/Way, not theirs. Israel cannot remain on the fence. Each individual must fight. If we do not fight; then by default, we are siding with Satan and allowing him to take us under. So, whom do we need to fight? The Synagogue of Satan. Who are they? Well, who controls the world right now? The wicked people who sold their souls for power and wealth. They are lead by a small group of counterfeit Jews who falsely claim to be God’s Chosen, but who are a den of thieves. Don’t think they don’t know whom they serve (mammon/materialism) or the fact they are a cult religion that sacrifice others for this worldly gain. Well, they don’t truly gain anything by killing the bodies (vehicles) of souls, except a ticket to Hell-fire. Of course, they don’t believe in Hell-fire; they don’t even believe in God. They probably don’t even know their god (Baphomet/Satan), who rewards them for their evil works, hates them, and plans for their destruction. He knows they are going into Hell-fire with him. And he laughs at them too. Satan, the opposer, is the enemy within us all, testing us, so that we have a chance to prove to God that we can choose good over evil by free choice. Unfortunately, that isn’t what we are doing right now. We are lost, living under and with a beast we created, funded, and to which we gave power. And we fear it more than God. Big mistake. We don’t even fight the Synagogue of Satan correctly. We fight him using his rules, not God’s. We must fight as one nation under God. That is the only way. Man created legislation. God doesn’t care about it, because He already wrote the Law. Read Deuteronomy, it’s all in there. He also said not to add to His law. So, don’t expect a lot of help from Him fighting Satan’s way, lost in red tape. Put on his armor as an individual; be an Israelite, a Champion for God. Return to His Commandments; return your house to His Commandments; and return your country to His Commandments. Have faith. In fact, never lose faith (trust in God). Israelites are scattered around the world, not in the 8,000 plus square miles of land located in the Middle East. Man created the counterfeit-Jewish State of Israel in 1948. But, God created the Tribe of Israel generations before Moses, when he renamed Moses’ great-great granddad Jacob “Israel.” Israel means “Champion of God”, or one who does God’s Will. Israel had 12 sons who fathered the Ten Tribes of Israel and Two Tribes of Judah. They were Rueben, Simeon, Levi, Judah, Zebulun, Issachar, Dan, Gad, Asher, Naptali, Joseph and Benjamin. These tribes did not stay in Palestine, but scattered around the earth. And through biblical and historical research, where they went has been traced. This being the case, it might be prudent to think that when the Bible presents scripture on Israel, God means the House of Israel, not the State of Israel, which means He is referring to His children around the world, and not the Jewish State established by a resolution from the United Nations. When the Bible presents Israel’s punishments, curses, preservations, blessings and prophecies, it speaks of the trials and tribulations of a once-covenanted people, who lost their way. Now, they are known as the ten lost tribes of Israel. But where are the tribes thought to be? Rueben went to Northern France and Canada. Simeon went to Belgium. Dan went to Denmark and Ireland. Naphtali went to South Africa. Gad went to Gibraltar. Asher went to Canada. Issachar went to Australia and New Zealand. Zebulun went to Holland, Australia and New Zealand. Joseph/Ephraim went to England and Joseph/Manasseh went to America. Levites are mixed within all the tribes. Note that the House of Judah (Judah/Pharez and Benjamin) mostly stayed in the Palestine area, while Judah/Zarah went to Scotland and Northern Ireland. Of these Tribes, the Bible indicates that the Tribe of Joseph would become great. Joseph had two sons named Manasseh and Ephraim. Based on where they went, Manasseh is America the Great Nation and Ephraim is England and Great Britain and British Commonwealth. Both of these countries were Champions for God, spreading His Word around the world, being witnesses for God’s grace, love and power. And when doing so, they were blessed. But they stopped. In fact, they are now so infiltrated by the Synagogue of Satan that they even oppose the mention of His name and insist on separation from Him. Blessings will turn to curses for Israel, not the country, but the people scattered about the Earth who accept the laws of man over the Laws of God. It might behoove everyone who believes they must support, back, or protect the State of Israel as God’s chosen to rethink who “God’s Chosen” are and protect their own homeland and state of affairs. Marxism, communism and state-socialism are not of God, but the work of the devil. They are a false light and a false “hope” to the world. They want to move “forward” with their plans, but God’s people should fight to “return” back to Him with all their hearts, souls, minds and strength. Choose whom you obey. If you are a Champion of God, then you are a True Israelite, and grafted into the Chosen, just as Mohammad was in his fight to do God’s Will.